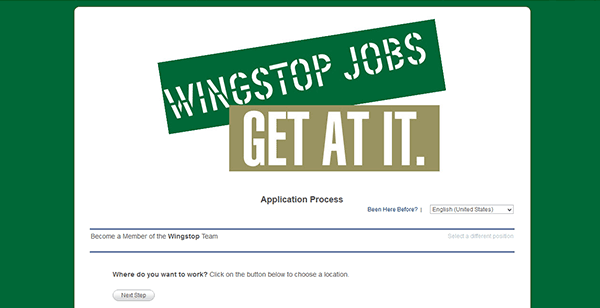 Download the Wingstop job application by clicking the link on this page. 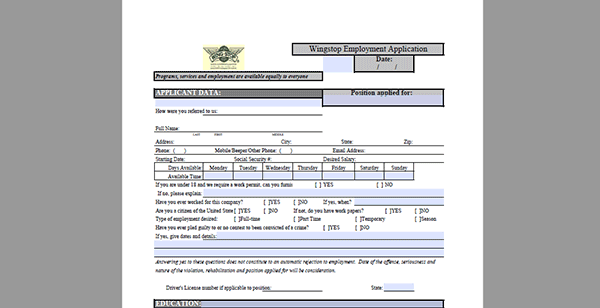 The application is also available online (on the company’s employment page). The guides posted below detail how to search/apply for jobs online, as well as how to fill out the printable application. It should be noted that some locations may not accept printed applications (it’s recommended to contact the location you plan on applying to). 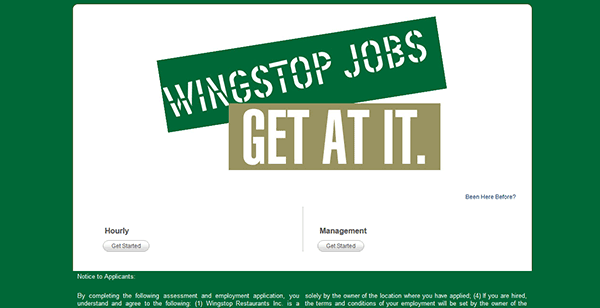 About the Company: Wingstop is an American chain of chicken wing restaurants based out of Dallas, Texas. The company has more than 1,000 locations across the country. Step 2 – Scroll down the page and then click the link of the job type that you’re interested in (e.g. corporate, restaurant, or support). 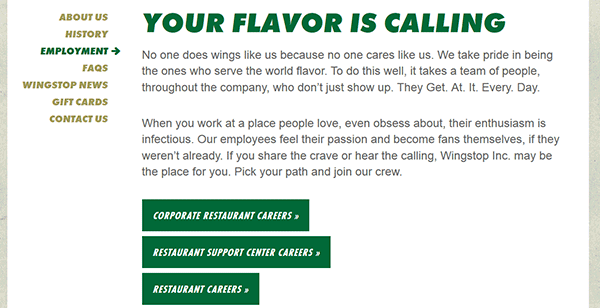 Note: This guide details how to find a restaurant job. 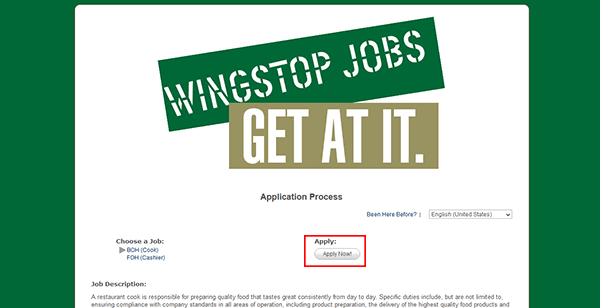 Step 3 – Scroll down the page and then press the “Apply Now” button to go to the main job search page. Step 4 – Press the “Get Started” button of the job type you want to submit an application for (e.g. hourly or management). Step 5 – Hit the button as outlined in the screenshot to move to the next section. Step 6 – Click the “Next Step” button. 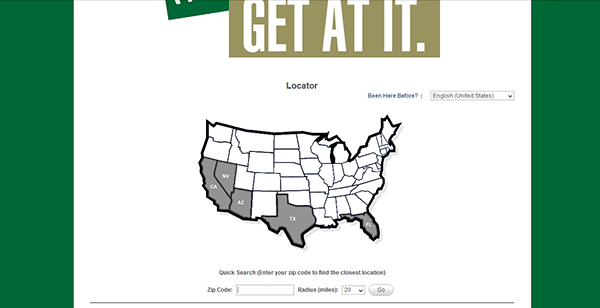 Step 7 – Enter your zip code into the form and then click the “Go” button. Step 8 – If any locations in your area accept online applications click the appropriate button to go to the next step of the process. 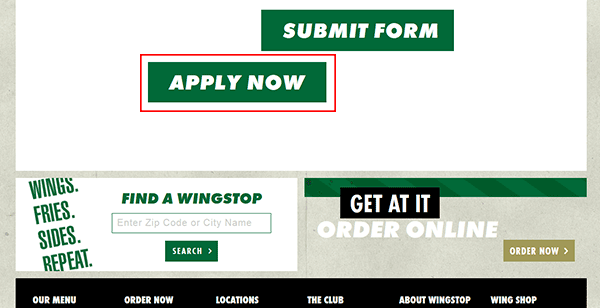 Step 1 – Download the application by pressing the button at the top of this page.